Six buildings along First Avenue that connected two sections of proposed district were removed because they lacked significance. 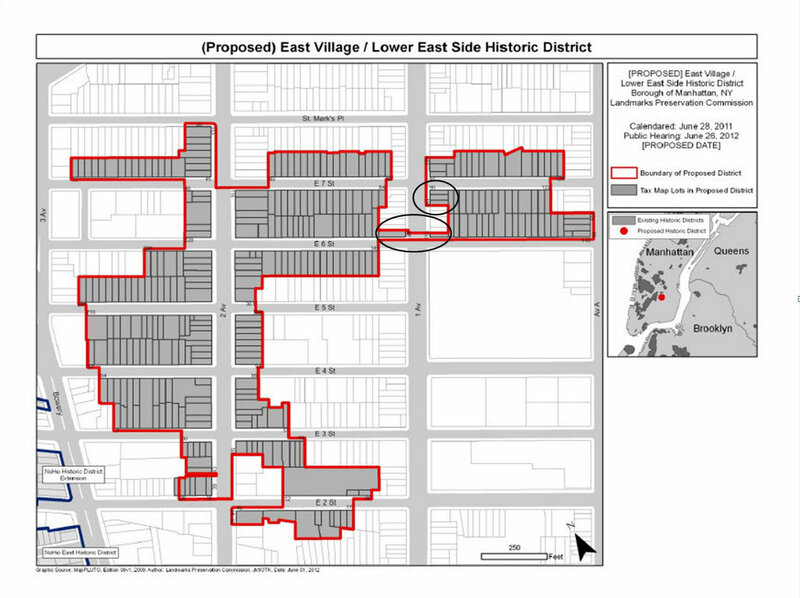 On October 9, 2012, the Landmarks Preservation Commission voted to create the East Village/Lower East Side Historic District. The district, divided into two sections, includes approximately 325 buildings primarily along Second Avenue and its side streets between St. Marks Place and East 2nd Street. A smaller section of buildings are located along East 6th and East 7th Streets between Avenue A and First Avenue. The area was developed in the early half of the 19th century and was home to waves of immigrant groups. Realtors christened the neighborhood “Village East” (and later the East Village) in an attempt to attract middle class residents following the removal in 1955 of the elevated Third Avenue line. Tenements dominate the area, reflecting a variety of architectural styles, including Italianate, Neo-Grec, and Queen Anne. According to Landmarks staff, almost all the buildings in the district were built prior to the Depression of the 1930s. At the October meeting, Mary Beth Betts, director of research at Landmarks, recommended removing six properties included in the proposed district’s boundaries because they lacked architectural significance. Five of the properties face First Avenue between East 6th and East 7th Streets, and the sixth property is at the corner of East 7th Street and First Avenue. The group of buildings served to connect the district’s main grouping of buildings with the smaller cluster of buildings east of First Avenue. According to Betts, the research department initially believed it was necessary to connect the two sections straddling First Avenue, but after consulting with Landmarks’ counsel, it was determined that the connection was not needed. Circled lots were removed from the boundaries of the East Village/Lower East Side Historic District. Before asking the other commissioners for their thoughts on the district, Chair Robert B. Tierney stated that he understood the concerns raised during the designation process, but believed they did not “diminish the validity of this district, the importance of it, or what it says about New York City.” He added that Landmarks had a demonstrated ability to “forge successful partnerships with religious groups and property owners,” and was committed to working with the community. Commissioner Margery Perlmutter disagreed with the other commissioners, finding the area to be unworthy of historic district status. Perlmutter said that tenement buildings, which she called a “famously poor housing type,” were common throughout the City and sufficiently preserved in other historic districts. She stated that while “there are definitely things within the contours of this historic district that are worth preserving and protecting,” the goals of the district were inadequately focused. She also argued that the Essex Street area is better identified with the Lower East Side. Landmarks voted 6-1-0 to create the new historic district with recommended boundary modifications. LPC: East Village/Lower East Side Historic District, Manhattan (P-2491) (October 9, 2012).